SUMMARY: Turkey is one of my favorite countries. Why? I first visited Turkey in 1978 and decided that it was one of the places I’d like to visit again, which I did thirty four years later. I wasn’t disappointed and you won’t be either. My notes are organized into three sections: first, a description of the main destinations we visited; second, overall suggestions and travel tips; third, a listing of recommended places and activities to consider for your trip. Istanbul: Summary: This is one of the notable cities in the world to visit. You will appreciate its heritage as the former capital of the Roman Byzantine Empire, then the capital of the Ottoman Empire. It occupies a unique location spanning the European and Asian continents, and while it is more crowded and more expensive generally than other places in Turkey, Istanbul offers so much to see and do that it is worth the effort. 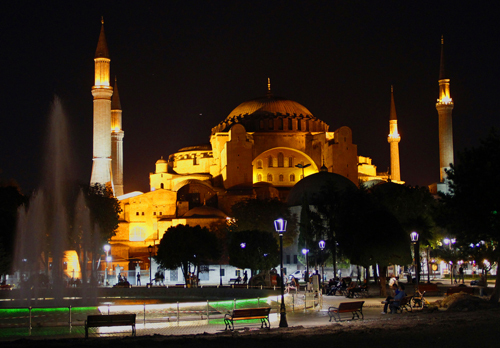 WHAT WE LIKED ABOUT ISTANBUL: The city is very attractive by day or night. It blankets a series of hills and peninsulas, so look for places where you can get views of the vast city and the harbor. Take one of the ferry boats that crisscross the water day and night. At night you’ll be dazzled by the dramatic lighting on mosques, fortress walls and bridges. The night boat tours are one of the highlights of an Istanbul visit. TIP FOR PHOTOGRAPHERS: Bring a tripod. You will use it, especially for night shots. Getting around Istanbul was fairly easy, with a good tram system and abundant taxis, buses and ferries. Be prepared to walk a lot, though, and there’s lots of hills in some popular districts. We felt completely comfortable mingling with the local people we encountered everywhere we went. Travel guidebooks provide all the details you need about places to see, so here is a brief summary of places I liked and recommend to you, mostly in Sultanahmet: Hagia Sophia, Blue Mosque, Roman cistern, Suleymaniye Mosque, the Grand Bazar, Topkapi Palace, Galata Tower, the old city walls. TIP: Whirling dervish shows are free at the Dervish Cafe and Restaurant located between the Hagia Sophia and the Blue Mosque–this is a very pleasant place to rest, enjoy tea or a snack in the outdoor patio, and during the evening watch the dervish show. Next door is an attractive hammam (Turkish bath)–expensive but high quality. TIP: Look for restaurants in Sultanahmet with a rooftop view of the nearby mosques and the harbor; prices are the same as in the non-view places. BEWARE OF SATURDAY NIGHT WEDDINGS AT YOUR HOTEL; both of our Istanbul hotels had big, noisy weddings from about 6pm til midnight in their courtyards on Saturday night. Ask your hotel about weddings when you book. 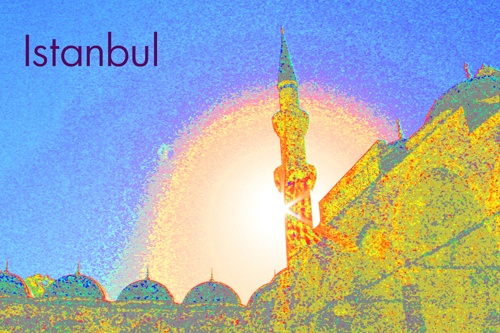 TIP: Hire a guide as soon as you reach the Blue Mosque area. They hang out there. He/she will take you to the attractions in the area, tell about them, and buy your tickets so you will avoid very long lines you are escorted directly to the entrance each time! This worked out great. Licensed guides who freelance work on tips. The Dolmabahce Palace is ornate but isn’t as great as expected; it looks like a wanna-be Versailles, and the optional Harem tour was not very interesting or attractive. If you are brave enough to stay in a furnished apartment or hostel, it could be an affordable alternative lodging, but we suffered from the heat (no airconditioning) and mosquitoes. ANKARA: SUMMARY: Pleasant but not a tourist highlight. The capital of Turkey is mostly a modern city with few historical sights. It is a pleasant city with good shopping, lots of restaurants, an archaeological museum, and an impressive monument to Attaturk. Here we had our best hammam experience at the old, authentic Sengul Hammam (Turkish Bath). From a tourist standpoint, if time is limited, I would say one day is sufficient, or it can missed altogether because the rest of Turkey is so much richer in special sights. You can get around the city easily and affordably using the local minibuses (called dolmus) or local buses that are clean, cheap, frequent; taxis are everywhere. There’s also a subway. The airport is far from town (thirty to forty five minutes drive), so for two of us it was cheaper to hire a private car. The Attaturk Memorial is not to be missed; you will need at least two or three hours to see the in-depth displays of the history of modern Turkey as well as the life of their incredible leader, Mustafa Kemal Attaturk. TIP: Read as much as you can about Attaturk; try the acclaimed book “Birds Without Wings” for an overview of late 19th century Turkey and its great leader. 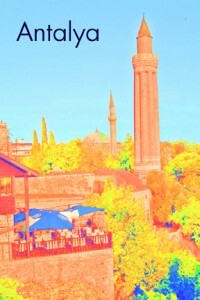 Ankara has a climate like S. California–in September it was dry, warm days and cool nights. Don’t be afraid to try small restaurants; one of our favorites was in the old part of town, near the Sengul Hammam, and a wonderful meal with chicken kebab, rice, salad and a yogurt drink cost just 6 lira ($3.25 US). The famous Archaeological Museum was disappointing; it’s not well organized and even the rented audio guide didn’t help much. CAPPADOCIA: Summary: One of the interesting places in the world to visit. The natural rock formations that have been carved into homes for people, livestock and pigeons are simply amazing. The region is historically rich, and endlessly picturesque. 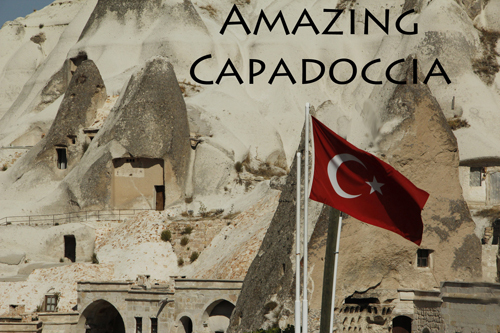 WHAT WE LIKED IN CAPPADOCIA: Cappadocia is actually the name of a large region in central Turkey where ancient peoples built homes and cities in rocks above and below the ground. To see the sights spread throughout this area, you can either rent a car, or better, take a tour. There are several towns in the Cappadocia area, but Goreme is my favorite; Urgup was a good second choice (especially with the fabulous Gamirasu Cave Hotel nearby—see notes below). 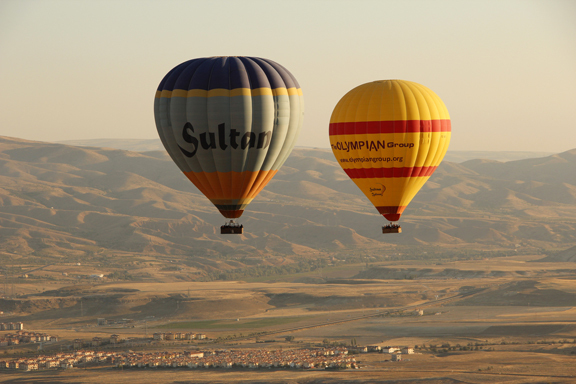 The hot air balloon rides are not to be missed (see notes below about our experience with Sultan Balloons). Depending on how much you enjoy archaeology and history, and your desire to see lots of varied rock formations and churches that date back one or two thousand years, you should plan to spend three to five days seeing much (but not all) of what Cappadocia offers. If you buy a souvenir at the shop or factory where your tour guide takes you, chances are good that you will overpay. The ornamental plate we bought at an impressive cave factory cost about 3 times more than we could buy it for in Istanbul. 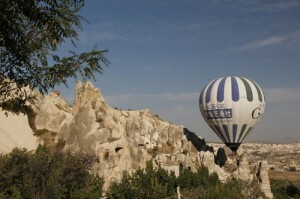 A balloon flight is highly recommended; about 80 balloons a day rise from the outskirts of Goreme before sunrise. There are many vendors of balloon flights, so shop carefully and choose an established, professional one. Stay in a genuine cave hotel! 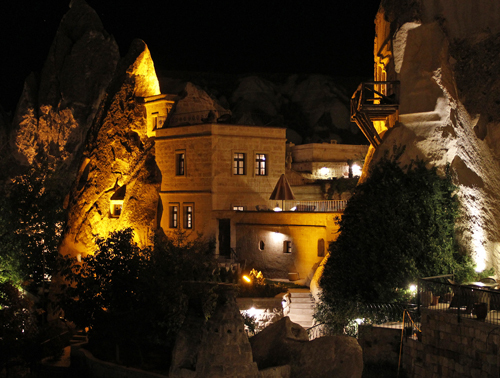 They are built around original rock dwellings and it’s magic to sleep in a comfortable room built inside a rock formation (see notes below about Cappadocia Cave Suites in Goreme and Gamirasu Cave Hotel near Urgup—both fantastic places). 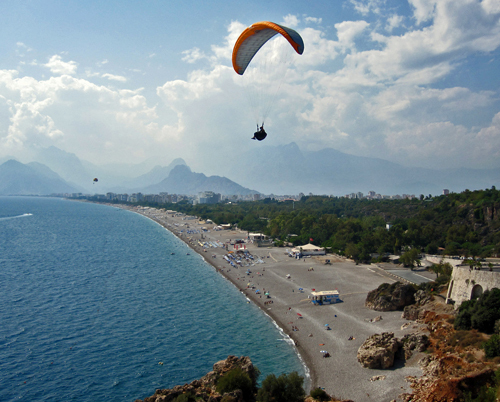 ANTALYA: Summary: Antalya is conveniently located on the Mediterranean Sea in southern Turkey, and it provides a nice base from which to see the surrounding Roman ruins, beaches and mountains. The old city of Antalya with its ancient fortress walls, winding streets, assorted restaurants and the cliff-top views of the old Roman harbor are a pleasure to experience. It has a spectacular archaeological museum that was one of the highlights of the trip. WHAT WE LIKED ABOUT ANTALYA: While the modern city of Antalya is surprisingly large, the old, walled part of Antalya is compact and special. The mosque, old clock tower, Roman harbor, ancient fortress walls and narrow winding cobblestone streets make it a special place. There are a number of restaurants perched on the cliffs above the ocean with great views. TIP: Early in the evening, find the town’s big fountain near the harbor and you’ll love watching the free classical music water-light-show. Not far from the Archaeological Museum you will find the town’s sand beach, where you will probably want to rent lounge chairs and umbrellas so you can relax in the shade and enjoy swinning in the pleasantly warm Mediterranean waters. Antalya was a good base from which to visit Roman ruins of Perge, Pergamon and Side, as well as taking a couple of boat trips to swim and explore other areas. TIP: We hired a car and a driver for the entire day at a very reasonable price. The only thing that will shock you is the price of gas–for us it cost nearly $10 per gallon. We spent about 5 days in Antalya; this was too long. Two or three days was sufficient. 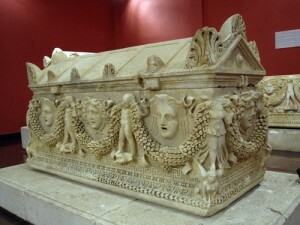 You cannot miss the Antalya Archeological Museum. 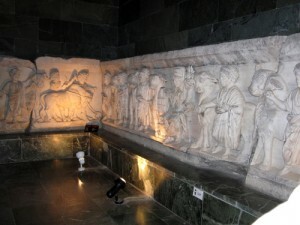 It is well organized and filled with the most amazing Roman carvings and Byzantine paintings. The waterfall tours, which are highly promoted, are so-so. You do get a view of the city, and you get to swim in the Mediterranean Sea, but the waterfall flows between tall apartment buildings before dropping from the cliff into the sea. It was a moderately enjoyable way to spend half a day. The “all day boat tours” are a good idea IF YOU CHECK THEM OUT; we unknowingly booked a boat tour that used a hideous, huge ship with vinyl red seats for 300 people, and no lounge chairs for relaxing. The obnoxious disco music never stopped until they decided to drop the soap suds on the dance floor. Other boats in the same harbor were smaller, and had nice open decks with lounge chairs for relaxing with 100 passengers. When you book your tour, ASK QUESTIONS about the boat you will get. Finding a great, uncrowded beach proved disappointly difficult. Brace yourself for beaches all around Antalya that are unbelievably crowded with mostly tourists from former Soviet Union countries, or Germany. The beach is barely visible from the back of fourteen rows of lounge chairs and umbrellas, as you are serenaded with loud disco music. Plan carefully to find your “ideal beach” if that is important to you. CANNAKALE/ TROY/ GALLIPOLI: Summary: This was one of the highlights for me. Cannakale is a very pleasant city, with a wide promenade along the Bosphorus; it is the gateway to the nearby Gallipoli peninsula and Troy. Ancient Troy is only a 30 minute drive away. Nearby Gallipoli is a special place if you are interested in WWI history as it relates to Australia, New Zealand and Great Britain, and its impact on creating modern Turkey. 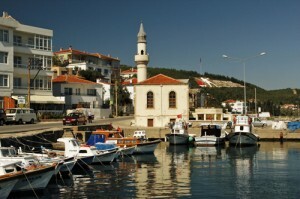 WHAT I LIKED ABOUT CANNAKALE/TROY/ GALLIPOLI: Cannakale is a small city that borders the beautiful Bosphorus Strait. This is a very nice place to stay while visiting nearby Troy and Gallipoli. I stayed near the ferry boats and the waterfront promenade, and it was so pleasant. The $1 ferry boat to Gallipoli was a blast. 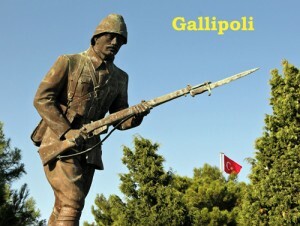 Gallipoli is a peninsula where unforgettable battles between Turkey and the British Empire forces took place in WWI. Despite the sombre undertone of all the fighting and deaths that occurred there, Gallipoli is also a surprisingly beautiful place. I loved the beauty and the poignant history of the place. Cannakale has a few sights to see (which I couldn’t see because they were closed on Mondays), but I would only go there to relax and use as a base for seeing adjacent sites. 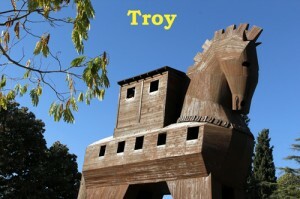 Troy is a place I had to see since it is so close (30 min drive) and so famous. It is mostly ruins and you have to rely on reconstructions of what the ancient cities of Troy used to look like. Worth visiting, but you’ll have to mostly use your imagination. TIP: Look for a man in the souvenir shop at Troy who wrote the definitive history of Troy; he is a world expert in the history of Troy! Gallipoli is special. If you take the time to watch a DVD of the history of the battles of Gallipoli, or read the book “Birds without wings”, you will appreciate the unforgettable power of this place. There are 32 cemeteries on the peninsula, and yet the feeling of the place wasn’t all morbid, instead it was a bitter-sweet mix of heroism, altruism, kindness, cruelty and futility, all among the natural beauty of this national park setting. 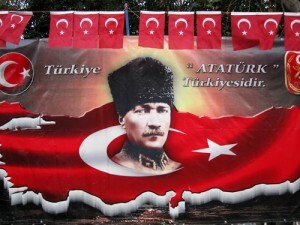 Attaturk cemented his place in modern Turkish history through his heroic actions during the fighting in Gallipoli that helped the Turks defeat the Allies. How to see Gallipoli: I took a ferry across to nearby Kilitbahir (gorgeous 10 minute ride) and then found a dolmus (minibus) heading down south to the tip of the peninsula. The ride was surprisingly pretty along the turquoise blue Bosphorous waters and through little towns tucked in the hills. I did this because most tours don’t take you down to the south area of Gallipoli, which I wanted to see, so I did it myself and was so glad I did. In addition I signed up for a guided tour of mid/north Gallipoli (see Hassle Free tours described below) which was worthwhile. It was long day, but I got to see so many important war sites. (Note: I needed to continue on to Istanbul after the Gallipoli tour, and Hassle Free tours offered this option; so after five hours I arrived in Istanbul. They take visitors to or from Istanbul and Gallipoli, which is useful. Cellphone service was way too expensive (almost $3 per minute) but the workaround was my laptop that we used constantly for booking flights and talking with anyone via Skype. TIP: Always carry small Turkish lira bills; often you cannot get change for a 50 or 100 lira note. WEATHER: Beware of very high heat in the summer. Coastal areas can be humid, winter cold, inland areas dry. CLOTHING: Bring layers. You can buy whatever clothing that you forgot to bring. Men never wore shorts even on hot days, except on the coast, and fairly casual clothes sufficed. Women have a surprisingly wide latitude of wardrobe choices since Turkish women wear everything from very stylish Western-style clothes to the conservative Islamic covering. TURKISH LIFESTYLE: Driving is a nerve-wracking exercise. Turkish drivers routinely miss other vehicles or pedestrians by mere inches, and they honk their horns incessantly as a form of communication between drivers. Road signs are only in Turkish. Surprisingly, I never saw any joggers, exercise walkers or bicyclists–most people smoke cigarettes, and the roads & sidewalks are not conducive to exercising (the roads are not a safe place to walk, jog or bike, and the sidewalks tend to be so uneven that walking on them can be a challenge). TURKISH PEOPLE: Turks are a fascinating group of people who show the five thousand years of different cultures that have passed through here; many men and women have blue, green or light brown eyes and a European appearance. 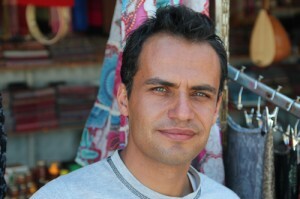 In eastern Turkey, many Turks have a more Asian, maybe Mongolian, appearance. This ethnic blending is one of the special aspects of this country. 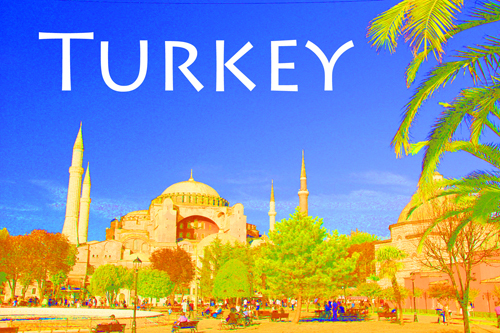 HONESTY: Our experience was that consistently we were treated with honesty in our dealings with people in Turkey. For example, in a small shop I overpaid for a bottle of water, and the shopkeeper handed me back the excess money I had paid. At a food market, when I paid a fruit vendor for 1/2 kilo of grapes, he very carefully kept adding grapes until it was exactly 1/2 kilo–I wouldn’t have noticed the difference. WOMEN IN TUKEY: This place has no resemblance to a place like Saudi Arabia or Iran. Turkish women are fascinating because of their surprisingly wide range of attire; particularly in the large cities, you see stylish women with their heads uncovered mixing freely with the more conservatively dressed women who have a scarf covering their hair (but never their face). Men and women mix comfortably together all over Turkey, as do the more conservative and more liberal women. SAFETY: Contrary to the way the news portrays the whole middle east (which for many folks includes Turkey), travelling in Turkey has been altogether a pleasure, with no hint of danger or discomfort with any of the myriad people we were surrounded by in crowded markets, subways, minibuses, farm villages, etc. We experienced consistent politeness, acceptance, and a willingness to help. I feel completely comfortable exploring anywhere in Turkey. SMOKING: A large number of men and women smoke here. Fortunately there is a non-smoking section in restaurants, and smoking is not allowed in any public transportation. COMMUNICATING: Sometimes it can be difficult to find someone who speaks English, but when you ask for assistance, someone will go out of their way to find a person who speaks English and who will help you. So to a great extent, Turkish people seem unusually kind and helpful. TRANSPORTATION: Local city buses are comfortable, clean and frequent. Alternatively you can catch an inexpensive mini-bus called a dolmus; they are common and go all over a city. Taxis are abundant, nice and clean. Gasoline is so expensive…currently about $10 per gallon! Inter-city buses are a great means of transportation–the bus from Ankara to Capadoccia was clean, comfortable and relatively inexpensive. We had an attendant serve beverages and snacks, while watching the built-in TV screen in front of our chair! TIP: Make advance reservations–Our 7:30am bus was booked, so we waited til the 9am bus. Lastly, the Turkish airlines were great–punctual, clean, very reasonably priced, and they serve meals on every flight! TURKISH BATH: The sequence you will enjoy is: shower, sauna, lie on square marble pedestal, get scoured with a rough mitt to get rid of dead skin, then shower again, lie down again, get soaped and massaged, then shower one last time. Fun, relaxing and memorable for $17 for about an hour experience. Highly recommended. ISTANBUL: First night we stayed at the Ibis Hotel, 10 minutes by taxi from the airport. I only recommend it if you need a place for the night before returning to the airport. The hotel is next to a busy highway with no sidewalks, so if you want to leave the hotel to go anywhere, you must take a taxi; also, because it was Saturday night, we got to hear 6 hours of a joyful but noisy wedding. The room was compact and clean; breakfast was very good. or call +90 384 271 28 00. Near Urgup we stayed at one of the original cave hotels in the region, the five star Gamirasu Cave Hotel, winner of the 2012 Trip Advisor’s “Travelers Choice” award. This hotel is so special that TripAdvisor included the Gamirasu Cave Hotel in its list of “Top 10 Most Fantastic Hotels in the World”. The owner, Ibrahim Bastun, and the General Manager, Ms. Hamide Demiral, are as nice and helpful as you could ask for. The hotel is built among a complex of caves in a valley that runs through a small village nearby, and each of its 32 rooms is unique and elegant. There is a small but very pleasant swimming pool which was a delight on a hot afternoon. There are two restaurants, but our favorite one was on a rooftop overlooking the valley, caves and town. Breakfast is a feast; dinners are prepared by a chef who knows how to prepare great meals. The only downside is that the hotel is located about 15 minutes away from the main town of Urgup, but they provide free shuttle transportation and this modest inconvenience is overshadowed by the specialness of the hotel. Be sure to ask one of the hotel staff to take you on a tour of the caves across from the hotel; they were the most interesting caves I saw in the region. Also, take a walk through the little village and see what real, rural Turkish life is like. Check it out at www.gamirasu.com; phone +90 384 354 58 15, or email hamide@gamirasu.com. If you sit and have a drink with Ibrahim, ask him the story of how he built this first-ever cave hotel, and how he came up with its unusual name. While in Urgup, try to eat at Ziggy’s Shoppe and Cafe, especially around sunset. The upstairs patio has a beautiful view of the town and sunset. TUVANA HOTEL in ANTALYA:We were lucky enough to find a room at the Tuvana Hotel in the old city part of Antalya; the Lonely Planet book called it one of the nicest boutique hotels on the Mediterranean coast. It is actually a series of three buildings that date from the Ottoman period 350 years ago, so it is fascinating to stay in such a historic place. The General Manager, Nermin Sumer, is charming, helpful and well-spoken, so she will make sure you enjoy your stay. Our room on the top floor had a nice view of the old city. The furniture in the room was not as fancy as I might have expected, but everything else was great. The swimming pool area and adjacent garden cafe were beautiful, and provided welcome relief from the hot, humid weather. Breakfast was served in the open courtyard of one of the three buildings and it was a real feast. The location is quite convenient to all the sights of the old city. 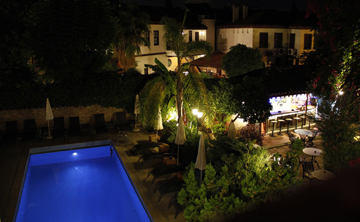 The Tuvana Hotel is a great place to stay in Antalya; you can see more at www.tuvanahotel.com; phone +90 242 247 60 15 or +90 244 40 53 or 54; email nsumer@tuvanahotel.com. CANNAKALE/GALLIPOLI/TROY: I decided to rough it as a reminder of my former backpacking days, so I stayed at the budget Egem Pension downtown near the ferry boats and boardwalk. For $27 a night, I couldn’t complain about a Spartan room at the top of four flights of stairs; the view from my little patio was great, the room was quiet, but it takes a certain sort of traveler to accept this one or two star place. A basic breakfast was included. Hassle Free Travel Agency was an excellent choice for my tours of Troy and Gallipoli. The guide had an outstanding way of bringing to life the history of the places we visited. The fact that they offered an option to tour Gallipoli and then stay on the bus to Istanbul worked perfectly for me. 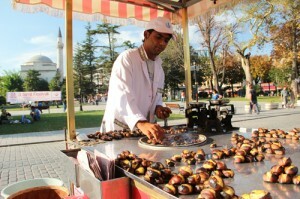 You can find them at www.anzachouse.com or call +90 286 213 59 69.